In this study, a polyclonal antibody with high avidity and specificity to the potent hypocholesterolaemic agent rosuvastatin (ROS) has been prepared and used in the development of highly sensitive enzyme-linked immunosorbent assay (ELISA) for determination of ROS in plasma. ROS was coupled to keyhole limpt hemocyanin (KLH) and bovine serum albumin (BSA) using carbodiimide reagent. ROS-KLH conjugate was used for immunization of female 8-weeks old New Zealand white rabbits. The immune response of the rabbits was monitored by direct ELISA using ROS-BSA immobilized onto microwell plates as a solid phase. The rabbit that showed the highest antibody titer and avidity to ROS was scarified and its sera were collected. The IgG fraction was isolated and purified by avidity chromatography on protein A column. The purified antibody showed high avidity to ROS; IC50 = 0.4 ng/ml. The specificity of the antibody for ROS was evaluated by indirect ELISA using various competitors from the ROS-structural analogues and the therapeutic agents used with ROS in a combination therapy. The proposed ELISA involved a competitive binding reaction between ROS, in plasma sample, and the immobilized ROS-BSA for the binding sites on a limited amount of the anti-ROS antibody. The bound anti-ROS antibody was quantified with horseradish peroxidase-labeled second anti-rabbit IgG antibody (HRP-IgG) and 3,3',5,5'-tetramethylbenzidine (TMB) as a substrate for the peroxidase enzyme. The concentration of ROS in the sample was quantified by its ability to inhibit the binding of the anti-ROS antibody to the immobilized ROS-BSA and subsequently the color intensity in the assay wells. The assay enabled the determination of ROS in plasma at concentrations as low as 40 pg/ml. Rosuvastatin (ROS); (3R,5S,6E)-7-[4-((4-fluorophenyl)-6-(1-methylethyl)-2-[methyl (methylsulphonyl) amino]-5-pyrimidinyl]-3, 5-dihydroxy-6-heptenoic acid (Figure 1), is an effective 3-hydroxy-3-methylglutaryl-coenzyme A (HMG-CoA) reductase inhibitor and it is widely prescribed in the treatment of patients with hypercholesterolaemia . ROS is available as Crestor in tablet form (5, 10, 20, or 40 mg) for oral administration. In clinical studies, ROS (1-80 mg) produced highly significant dose-dependent reductions in low-density lipoprotein cholesterol (up to 65%) and was well tolerated. The pharmacokinetics of ROS following single and multiple-dose administration of the drug to healthy volunteers have been investigated. The absolute oral bioavailability is greater than 20%, and the elimination half-life is ~ 20 hrs. The reported ROS plasma therapeutic concentration was 19 ng/ml, after 40 mg-daily dosing. The elimination of ROS is primarily via the liver. In a clinical trial, ~ 90% of the orally administered dose of ROS is recovered in feces as unchanged drug . 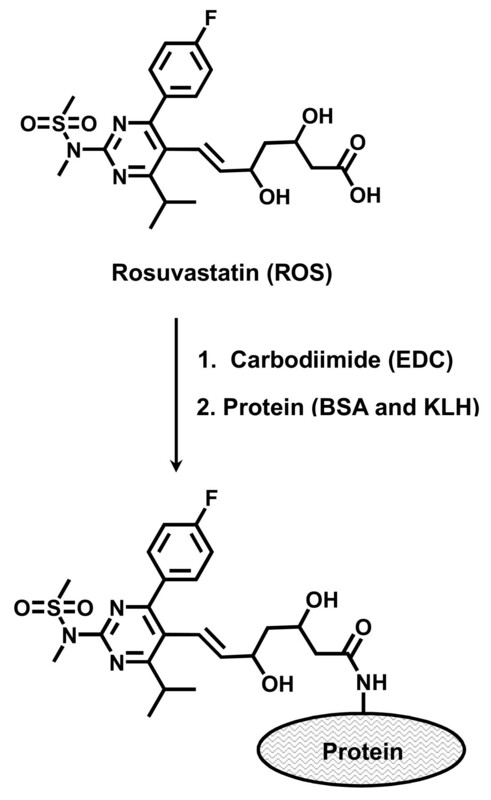 Preparation of ROS-protein (BSA and KLH) conjugates. Because of the clinical success of ROS, several methods have been developed for its quantitative determination in plasma samples. Almost all of these methods are liquid chromatography [3–9]. These methods involved tedious steps for the pre-treatment of the samples, pre-derivatization with critical derivatizing reagents, and use of expensive detectors (e.g. tandem mass spectrometry) that are not available in most laboratories. For these reasons, the development of new alternative analytical technology for determination of ROS in plasma with adequate sensitivity, improved simplicity, and lower cost was seriously needed. Immunoassays have been widely used in pharmaceutical and clinical analysis because of their inherent specificity, applicability for a wide range of analytes, high-throughput, and low cost . ELISA is the most versatile format of the immunoassays. ELISA is remarkably quick, easily performed, and also offers great sensitivity when appropriate enzyme labels are used. As well, ELISA is well suited for the screening of large number of samples, and the specificity for the analyte of interest even in multi-component complex sample matrix such as plasma . The specificity of the antibody to the analyte of interest is the limiting factor in the validity of any immunoassay system. In order to establish a specific and sensitive ELISA for ROS, a specific antibody with high avidity for ROS was required. The present study describes, for the first time, the preparation of a polyclonal antibody that can specifically recognizes ROS with high avidity. The ELISA that has been developed using this antibody is able to determine ROS in plasma samples at concentrations as low as 40 pg/ml. Rosuvastatin (ROS) was obtained from Biocon India Ltd., India. Horseradish peroxidase labeled goat anti-rabbit IgG (HRP-IgG), bovine serum albumin (BSA), 2,4,6-trinitrobenzene sulfonic acid, 1-ethyl-3-(3-dimethylaminopropyl) carbodiimide hydrochloride (EDC), and tween-20 were purchased from Sigma Chemical Co. (St. Louis, MO, USA). Keyhole limpet hemocyanin (KLH) was purchased from Novabiochem Co. (La Jolla, CA, USA). 3,3',5,5'-Tetramethylbenzidine (TMB) peroxidase substrate was obtained from Kirkegaard-Perry Laboratories (Gaithersburg, MD, USA). ELISA high-binding microwell plates were a product of Corning/Costar, Inc. (Cambridge, MA, USA). Centricon-30 filter (Amicon, Inc., Beverly, MA, USA). BCA reagent for protein assay and protein A column were obtained from Pierce Biotechnology Inc. (Rockford, IL, USA). ROS was conjugated with keyhole limpet hemocyanin (KLH) and bovine serum albumin (BSA) according to the method described by Darwish et al . Briefly, EDC (150 mg) was added to ROS solution (10-ml, 5 mg/ml) in 12.5 mM phosphate buffer (PB) of pH 5, and the pH of the reaction mixture was maintained at pH 5-5.5 using 0.01 M HCl for 5 min. Five ml of protein solution (5 mg/ml, in 50 mM PB of pH 7.2) was added, and the pH was rapidly adjusted to pH 6.4 and maintained constant for 90 min. The reaction was left to proceed overnight in dark at 4°C. The uncojugated ROS was removed from the ROS-protein conjugates by buffer exchange using a Centricon-30 filter. Protein content of each conjugate was determined by BCA reagent kit and the extent of substitution of free amino groups on the protein was determined by estimation of free amino groups on equal amounts of the corresponding protein which underwent the same experimental treatment and on protein subjected to the conjugation by the procedure described by Habeeb . The extent of conjugation = (AROS-Protein/AProtein) × 100; where AROS-Protein and AProtein were the absorbances obtained from the reaction of 2,4,6-trinitrobenzene sulfonic acid with ROS-protein and protein, respectively. The extent of conjugation was found to be 10.8 and 20.4% of the total amino group residues on KLH and BSA, respectively. The immunogen used was ROS-KLH protein conjugate. Four female 8-weeks old New Zealand white rabbits were injected subcutaneously with 1 mg of ROS-KLH emulsified in Freund's complete adjuvant, divided in different sites for each rabbit. The same immunization procedure was repeated 6 times with 2-weeks interval, however incomplete adjuvant was used instead. After 4-7 days from each immunization, blood samples (~500 μl) were collected and diluted tenfold with PBS. The diluted blood samples were centrifuged at 10,000 g at 4°C for 10 min, and the sera (supernatants) were collected. The antibody response in each rabbit was determined by analysis of the collected antisera by direct enzyme immunoassay . 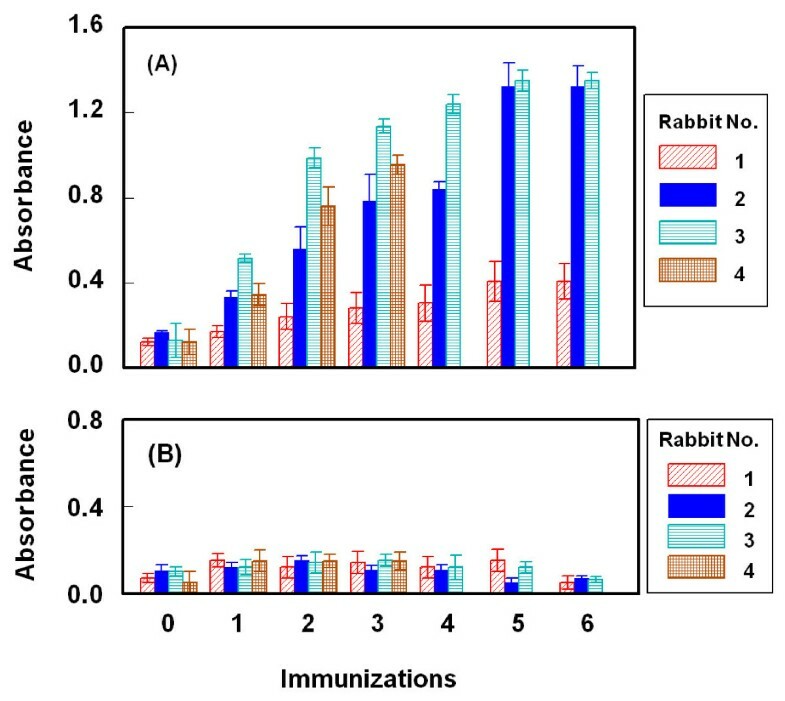 The rabbit whose diluted serum gave the highest avidity (lower IC50) to ROS was selected as the most appropriate rabbit for collecting its total serum as as crude anti-ROS polyclonal antibody sample. The serum (~20 ml) was kept overnight at 4°C and then centrifuged at 4°C for 10 min. To 5 ml of the supernatant, an equal volume of a saturated ammonium sulfate solution was gradually added and gently mixed. For complete precipitation of the IgG, the solution was kept over ice for 3 h. The precipitate was collected by centrifugation at 10,000 g at 4°C for 30 min. The precipitate was resuspended in 10 ml phosphate buffered saline (PBS; 137 mM NaCl, 3 mM KCl, and 10 mM sodium phosphate, pH 7.4) followed by reprecipitation with ammonium sulfate. After repeating this step three times, the precipitate was dissolved in 10 ml of PBS. The produced antibody solution was purified by protein A column chromatography. One milliliter aliquot of the solution was mixed with an equal volume of the binding buffer (1.5 M glycine-NaOH containing 3 M NaCl, pH 8.7) and the mixture was applied to the protein A column and the eluent was monitored for protein by measuring the absorbance of the eluted fractions at 280 nm. The column was washed with 50-60 ml of binding buffer, and the bound immunoglobulin was eluted with 0.1 M sodium citrate buffer (pH 3.0). The eluate was collected in 1.5 ml fractions into tubes containing 100 μl of 1 M Tris-HCl buffer (pH 9.0), and mixed. The pooled fractions were dialyzed overnight against five changes of PBS (~ 4 h intervals). The protein content of the dialyzate was determined by BCA reagent kit, and used as the pure anti-ROS antibody sample. Aliquot (50 μl) of either ROS-BSA conjugate or BSA protein solution (5 μg/ml in PBS) was dispensed in each well of the microwell plate. The plates were incubated for 2 h at 37°C. The wells were washed with PBS containing 0.05% Tween-20 (PBS-T) and blocked with 200 μl of 3% BSA by incubation at 37°C for 1 h. A 50 μl of anti-ROS antibody sample (rabbit serum or purified IgG) was dispensed in each well and plate was incubated for 1.5 h at 37°C, then the plates were washed with PBS-T, and 50 μl of HRP-IgG (1/5,000 in PBS) was added to each well. After 1.5 h incubation, the plates were washed with PBS-T and the amount of the bound HRP-IgG was quantified using TMB microwell substrate. In competitive ELISA, 50 μl of ROS sample (standard ROS solution or plasma that have been tenfold diluted with PBS) was mixed with antibody solution and 50 μl of the mixture was dispensed into microplate wells that have been previously coated and blocked. After, the competition reaction, the signal was generated as above. Where A is the signal at a definite known concentration of ROS, A0 is the signal in the absence of ROS, A1 is the signal at the saturating concentration of ROS, and IC50 is the ROS concentration that produces a 50% inhibition of the signal. The concentrations of ROS in the samples were then obtained by interpolation on the standard curve. Since ROS is a small molecule, it is not naturally immunogenic. In order to produce antibody specific to ROS, immunogenic conjugate (immunogen) must be first prepared by its covalently linking to a carrier protein. ROS contains reactive carboxylic group through which conjugation with protein could proceed directly. Although the introducing of a "spacer group" between the hapten molecule and the carrier protein usually increases the specificity of the antibody aimed to be produced , however the reactive COOH group of ROS is adequately spaced (6 carbon atoms) from its aromatic strong epitopic moieties  that is characteristic for the ROS molecule. Therefore, ROS was directly linked to the carrier proteins (BSA and KLH) by carbodiimide reagent (Figure 1). In order to ascertain the extent to which ROS was conjugated to the proteins, spectral analysis of the proteins and ROS-protein conjugates were conducted under the same pH conditions. The apparent molar absorptivity of ROS-protein conjugates was higher than that of the unconjugated protein. This hyperchromic effect was evident for the successful conjugation of the chromophoric ROS molecule with both BSA and KLH. The extent of conjugation was determined employing BCA reagent kit for protein assay, and the spectrophotometric procedures described by Habeeb . The percentages of ROS residues in ROS-BSA and ROS-KLH conjugates were found to be 20.4 and 10.8%, respectively. Because of the high immunogenicity of KLH , ROS-KLH was selected as immunogen for immunization of animals and ROS-BSA was selected for immobilization onto the microwell plates in the ELISA. To monitor the progress of the immune response of the rabbits and confirm that they were sufficiently immunized, serum samples were collected from the rabbits on the fourth to seventh days after each immunization, and were analyzed by direct ELISA . As shown in Figure 2A, the titers of the antisera (indicated by the absorbance values) increased with the repetitive immunizations, however, rabbit No. 1 showed weak response and rabbit No. 4 has been lost after the third immunization. As well, it was observed that the reactivity of the produced antibodies to the immobilized protein (BSA) was comparable to that before immunization (Figure 2B). These data indicated the specificity of the raised antibodies to the ROS residues in the immobilized ROS-BSA, but not to BSA molecules. The measured small absorbance values were attributed to the nonspecific binding. Although, rabbits No. 2 and 3 responded equally to the repetitive immunizations, however in order to select the more appropriate one for scarifying and collecting the total sera, the avidity of their antisera were checked by competitive ELISA as described above. As shown in Figure 3A, the serum from rabbit No. 3 has the higher avidity (lower IC50) for ROS. Therefore this rabbit was scarified and its total sera were collected as crude anti-ROS antibody, and it was purified by avidity chromatography on protein A column. Monitoring the immune response of rabbits immunized with ROS-KLH. Micowell plates were coated with ROS-BSA (panel A) and BSA (panel B). Antiserum samples after different consecutive immunizations were allowed to bind to the immobilized antigen (BSA and ROS-BSA). Signals were generated as described in the Experimental section. Avidity of antisera from rabbits No. 2 (▲) and No. 3 (○) for ROS (panel A), and the calibration curve for determination of ROS in plasma by ELISA (panel B). ROS-BSA was coated onto the microwell plates. Samples were transferred into the microwells. Binding reaction was allowed to proceed and the signals were generated as described in the Experimental Section. 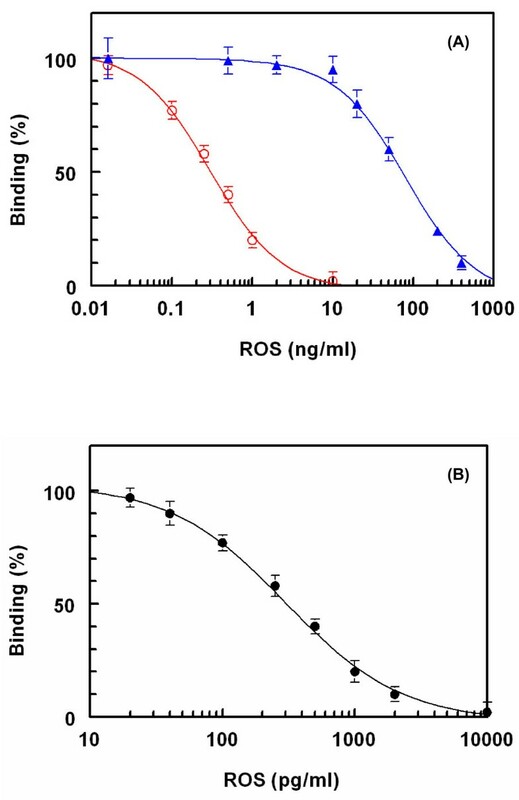 In order to determine the optimum limiting concentration of the purified anti-ROS antibody for effective competition between free ROS (as competitor in the test sample) and immobilized ROS (ROS-BSA coated onto the plate wells), titration of anti-ROS versus the solid phase ROS-BSA was carried. The limited (not saturating) antibody concentration that gave 1-1.5 absorbance unit (in the direct ELISA) was 2 μg/ml (Figure 4). This concentration was used in assessment of the specificity of the anti-ROS antibody by the competitive ELISA. 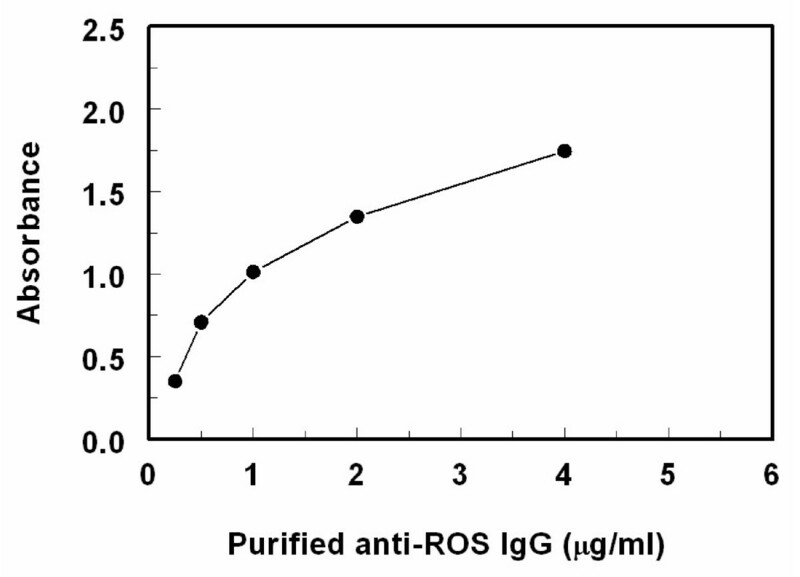 Titration of the purified anti-ROS IgG antibody versus immobilized ROS-BSA conjugate. The specificity of the antibody was determined by carrying out the competitive assay using various competitors. These competitors were HMG-Co A reductase inhibitors (atorvastatin, pravastatin, lovastatin, and simvastatin), and various drugs that are administered in combined therapy with ROS. 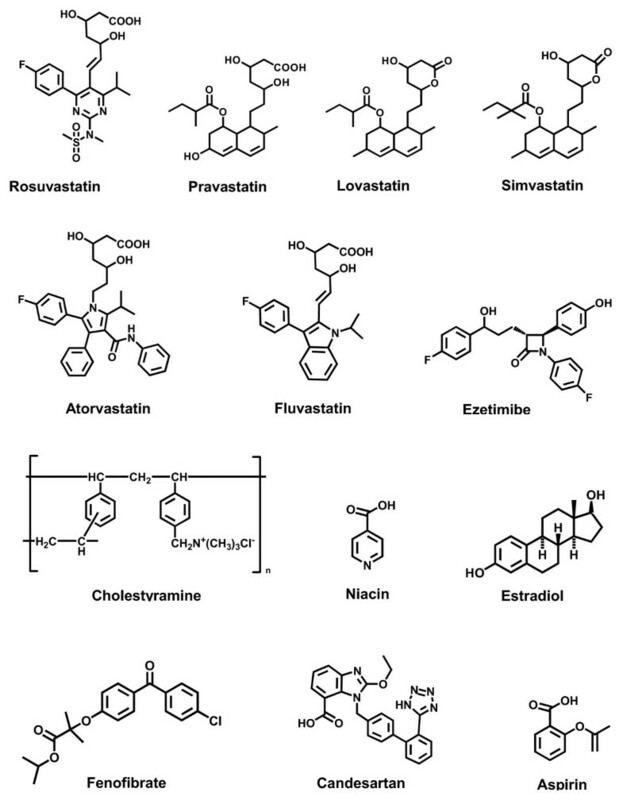 These drugs were ezetimibe , cholestyramine , niacin , estradiol , fenofibrate , candesartan , and aspirin ; the chemical structures of these competitors are given in Figure 5. The cross reactivity (CR) was calculated using the formula: IC50 (ROS)/IC50 (competitor) × 100, defining IC50 as the concentration of the competitor that causes 50% reduction of the maximum binding of anti-ROS antibody to the coating conjugates (i.e. 50% of the maximum color signal). The values of IC50 that have been obtained for the competitors, when possible, and their corresponding cross reactivities are given in Table 1. From these data, it was revealed that pravastatin, lovastatin and simvastatin, that share the 1,2,7,8,8a-hexahydronaphthyl moiety as a common backbone, did not cross react with the anti-ROS antibody. On the other hand, atorvastatin and fluvastatin exhibited small CR (4 and 2%, respectively) with ROS on the anti-ROS antibody. This feature indicated that the p-fluorophenyl group (common moiety in all the drugs) is a recognizable epitope for the antibody. This assumption was also supported by the slight CR (0.8%) that has been exhibited by ezetimibe that has the same moiety in its structure. The CR that has been exhibited by the HMG-CoA reductase inhibitors is not problematic in the analysis of ROS as these drugs are not co-administered simultaneously. None of the other competitors (the drugs that are used in combination therapy with ROS; Figure 5) showed any CR with ROS in the proposed assay proving the high specificity of the antibody for ROS, and its proposed ELISA for ROS determination (Table 1). Competitors that have been used in the evaluation of the specificity of anti-ROS antibody. The calibration curve of ROS using the proposed ELISA is shown in Figure 3B. This curve was generated using ROS at concentrations from 10 to 10000 pg/ml, prepared in PBS. The data showed good correlation coefficient (r = 0.996) on the four-parameter curve fit. The limit of detection (LOD) of the proposed ELISA, defined as the lowest ROS concentration significantly different from zero concentration at 95% confidence limit (mean of zero ± 4.65 SD) was determined . Based on the basis of 8 replicate measurements, the limit of detection in tenfold diluted plasma samples was found to be 40 pg/ml and the working range was 50-1000 pg/ml. This high sensitivity enables the determination of low therapeutic concentrations of ROS in plasma. The intra-assay precision was assessed at three different concentrations (low, middle, and high; Table 2) by analyzing 8 replicates of each sample in a single run and the inter-assay precision was assessed by analyzing the same sample, as duplicates, in 4 separate runs. According to the recommendation of immunoassay validation , the assay gave satisfactory results as the values of relative standard deviations did not exceed 5% (Table 2). Precisions and recovery studies of the proposed ELISA for determination of ROS at three different concentration levels. aValues are mean of 8 determinations ± the relative standard deviation (RSD). Studying the plasma matrix effect was required since the proposed assay was designed for quantitation of ROS in plasma. ROS-free plasma sample was serially diluted into PBS and each dilution was spiked with 200 pg/ml of ROS standard. The spiked samples were then analyzed by the proposed assay to investigate the feasibility of the assay. Acceptable recovery values  were obtained when plasma samples were diluted 10-fold with PBS. Therefore, plasma samples should be 10-fold diluted with PBS in order to avoid the possible false-positive analytical results. It is worth to mention that the high sensitivity of the assay (LOD was 40 pg/ml) allowed the high dilution of a clinical specimen (19 ng/ml after 40 mg dosing) to attain the ROS concentrations in the working range of the assay. The accuracy of the method was checked by recovery studies. ROS-free plasma samples (50 μl) were spiked with 50 μl of varying concentrations of ROS, and the spiked samples were mixed with 400 μl of PBS to give final concentrations of 50-800 pg/ml. The samples were subjected to the analysis by the competitive ELISA, and the recovery values were calculated. The analytical recovery values were 98.9-105.0 ± 1.89-4.38% (Table 2). This indicated the accuracy of the proposed method for determination of ROS in plasma samples, and absence of endogenous interfering substances in the plasma samples. In order to compare the proposed ELISA with HPLC, plasma samples were spiked with ROS at known concentrations and analyzed by a reported HPLC method. These concentrations were 0.001-0.05 μg/ml. These concentrations were selected based on the sensitivity of the HPLC method. As the proposed ELISA has higher sensitivity, the same samples were diluted with PBS to make their concentrations within the working range of the proposed ELISA method. The concentrations measured by HPLC were plotted versus their corresponding values that have been determined by the proposed ELISA. Regression analysis of the results was performed, and the results revealed the good agreement between the two methods: EIA = 0.00198 + 0.8768 HPLC (r = 0.988). The present study described the preparation of a highly specific polyclonal antibody against ROS. The antibody recognizes ROS with high avidity. The high specificity and avidity of the produced antibody enabled the development of highly specific and sensitive ELISA for the accurate determination of ROS in plasma without pretreatment at concentrations as low as 40 pg/ml. The assay produces a colored read-out, thus only a colorimetric plate reader is required. The entire protocol of the present assay is very easy to perform in a 96-well plate and permits an operator to analyze a batch of 200 samples per day when uses a pre-coated plates facilitating the processing of large number of samples. The proposed ELISA is expected to contribute to the pharmacokinetic studies of ROS as an effective alternative to the existing costive and instrument-intensive chromatographic technologies. The authors extend their appreciation to the Deanship of Scientific Research at King Saud University for funding the work through the research group No. RGP-VPP-065. ID designed the study and supervised HA in conducting all the experiments, discussed the results and prepared the manuscript. AA participated in preparation of protein conjugates and discussion of the results. HA prepared the antibody and conducted the assay development.